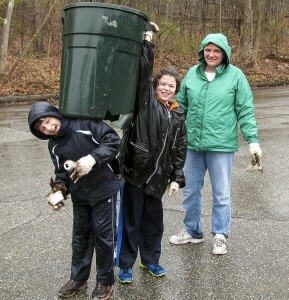 In spite of the rainy weather, over 50 volunteers came out to the Fells on Saturday, April 26 to participate in Park Serve Day. Friends of the Fells Board Members and volunteers, including Rich Sanford, Mike Ryan, Walter Kittredge, Bob Weggel, Ginna Day, and Karen Johnson, were on hand to provide their experience in service of directing the many newer volunteers. Some participants in the Friends of the Fells trail adoption program came out as well, giving them the opportunity to learn the identification and clean-up skills that will serve them well as Trail Adopters. Volunteers included families from Malden, Melrose, Medford, and even as far away as Brookline. A large group of 20 students and 2 adults from CATS Academy in Boston were brought to us by Lindsey Hopkinson who also helped lead half of that group to Doleful Pond. The Doleful Pond party site got a good scrubbing. All the trash and even much of the broken glass removed (about 4 large trash bags) by the CATS Academy crew. All of the invasive plant species targeted by Walter Kittredge were removed within the area he worked along the fire road behind gate 42. Some cleanup was performed around the perimeter of Greenwood Park. 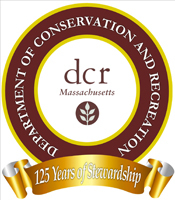 More than six trash bags full of litter was removed from the area surrounding Flynn Rink and the perimeter of Quarter-Mile Pond, including several large items (a tire, a large metal ring, some discarded sign posts, a broken trash barrel half-sunk in the pond) that were all recovered by the same small group. One late-arriving family set off along the Cross-Fells Trail east from Flynn Rink to pick up trash. The White Rock area was completely cleared by a very hard-working family of 4 (2 adults, kids 15 and 11) from Melrose with some help from Rich Sanford. 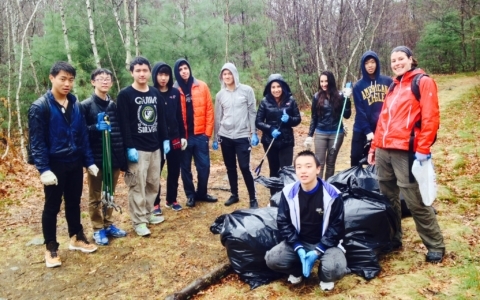 Trails around Bellevue Pond and Wright’s Tower were cleaned by a group of 4 volunteers who removed 2 large bags of recyclables, which they took home to recycle, and at least one very heavy bag of trash. 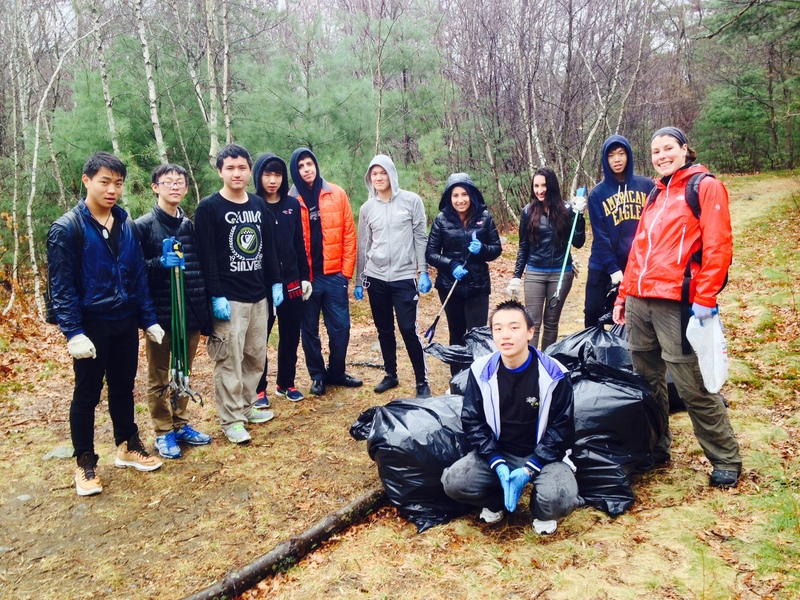 A cleanup was done around Long Pond by the Winchester Girl Scouts. A cleanup was done around the Rock Circuit Trail by the AMC volunteers. All in all it was quite the “spring cleaning” for the Fells! A special thank you goes out to Lynn and Anthony for all the support. The canopy was exceptionally helpful to keep us dry(ish) as we signed in the volunteers. The tools and supplies, timely trash pickup, and offers to open the Botume House restrooms were all much appreciated by the volunteers and by the Friends of the Fells. It was a pleasure working with you yesterday.